RICHMOND, Va. - Archeologists at Jamestown have unearthed a trove of tobacco pipes personalized for a who's who of early 17th century colonial and British elites, underscoring the importance of tobacco to North America's first permanent English settlement. The white clay pipes - actually, castoffs likely rejected during manufacturing - were crafted between 1608 and 1610 and bear the names of English politicians, social leaders, explorers, officers of the Virginia Company that financed the settlement and governors of the Virginia colony. Archeologists also found equipment used to make the pipes. Researchers believe the pipes recovered from a well in James Fort were made to impress investors and the political elite with the financial viability of the settlement. They are likely the rejects that failed to survive the ceramic firing process in a kiln. 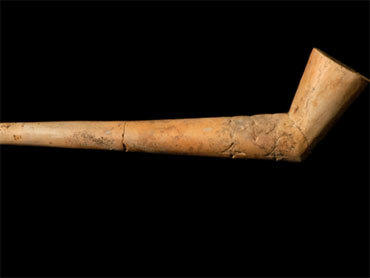 The find comprises more than 100 pipes or fragments. More than a dozen are stamped with diamond shapes and inscribed with the names or initials of luminaries including explorer Sir Walter Raleigh, who dispatched the colonists to the territory he named Virginia. He also is credited with popularizing tobacco in England and is said to have smoked a pipe just before being executed for treason in 1618. Other names include Capt. Samuel Argall, a major Virginia Company investor and governor of Virginia; Sir Charles Howard, Lord High Admiral of England; and Earl of Southampton Henry Wriothesley, a Virginia Company official who was also William Shakespeare's major patron. "It really brings the people back into the picture," said Bly Straube, senior archaeological curator for the Jamestown Rediscovery Project. "We have a lot of artifacts that we can associate with types of people like gentleman or women or children, but to find things like the pipe that bears the name Sir Walter Raleigh, I mean, my goodness. ... It just makes it very tangible and real." The discovery casts lights on the social, political and economic network behind the Jamestown venture that started in 1607, as well as the importance of tobacco to the settlement, said William Kelso, director of archaeological research and interpretation at Historic Jamestowne. Smoking imported tobacco was very popular in Europe in the early 17th century. After settlers arrived at Jamestown, tobacco quickly became the American colony's chief export. Among the immigrants Capt. Francis Nelson brought to Jamestown in 1608 was Robert Cotton, a tobacco pipe maker who likely fashioned the pipes found in the well. In 1614, the first shipment of Virginia tobacco was sold in London. Jamestown's tobacco exports to Europe grew from 10 tons in 1619 to 750 tons in 1639. "Tobacco, whose goodnesse mine own experience and triall induces me to be such, that no country under the Sunne, may, or doth affoord more pleasant, sweet and strong Tobacco, then I have tasted," Ralph Hamor, a secretary of the colony, wrote in 1614. "I doubt not, (we) will make and returne such Tobacco this yeere, that even England shall acknowledge the goodnesse thereof." Tobacco's popularity created a large demand for pipes that were typically made in London using white clay from Dorset, along England's southern coast. Interested in the lucrative new industry, investors in the Virginia Company sought to add pipemaking to its trades and sought out adequate clay from the surrounding area. Settlers, Kelso said, were under "tremendous pressure" to give investors the instant gratification they needed because "they put so much money into it," and didn't want to lose their lifeline to England. Colonists tried different trades such as silk making, glassmaking, lumber, sassafras and tar, with no financial success. "The whole idea was to make money for investors and they enlisted all these specialists that would search Virginia for profitable resources that they could exploit," Straube said. "Tobacco was the quickest and easiest and most successful." The survival of the pipes suggest that many more individualized pipes may have been made for investors and other powerful members of the 17th-century British establishment. Their discovery also may lead to new examination of thousands of other artifacts recovered at Jamestown for further context on colonists' lives. "Each new discovery has meaning beyond its own significance," Straube said. "It can make us look at the past in a different way, and that's kind of the exciting thing about these pipes."